1. I attended a yoga workshop! My teacher, Linda Spackman, called to invite me to a two-hour workshop she was giving on the Yoga Sutras. She felt it was tailor made for me to ease back into practicing. She was so right! We spent most of the class discussing ten of the sutras about cultivating clarity in the mind, then doing some breath work, some meditation, and about 15 minutes of gentle yoga postures. Oh, they felt so good! (I was humbled to discover I couldn’t touch my toes or get my heels to the floor in downward-facing dog…but it’ll all come back in time.) Yoga! Such good stuff! 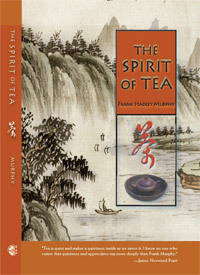 Frank Murphy's lovely book "The Spirit of Tea"
2. I was invited to afternoon tea with Frank Murphy, author of The Spirit of Tea, and photographer Kitty Leaken, who is now working on a book on tea rooms. We met at Reposo at the St. Francis Hotel where we enjoyed beautifully prepared Chinese teas (Kitty and I each had Oolong while Frank chose White tea). As luck would have it, I recently finished reading Frank’s book, so I could at least speak intelligently with him about it! But I was surprised to find him picking my brain about the tea business when he is one of the few folks who have actually completed the training of the American Tea Masters Association. It was quite an honor to meet him. I have Kitty to thank for the introduction to Frank and for including me in such a pleasant afternoon with two generous and artistic souls. 3. I splurged on a handmade reconstructed sweater from Etsy artist Jill2day. I’ve been slowly transitioning my wardrobe away from the fitted tops I’ve usually worn (they make me uncomfortably aware of my colostomy now) to more loose, flowing tops. I saw this gorgeous garment on Jill’s Etsy site and immediately placed it on my “favorites” list. For over a month I kept going back and ogling it. Then I read more about Jill and her work in an article on Etsy’s blog, which enticed me further. And, one day recently, I found there was enough money in my PayPal account – so I bought it!! I must say, it’s much more beautiful in person (and exceptionally well constructed) than the photo shows. Sooo, what do you think of my new look? 4. I went to a Women’s Workshop with my mom that was held this morning at her church. The topics presented were: self care, balance, and boundaries. All stuff I’ve had no choice but to work on over the past six months! Much of the workshop was a good reminder that when we’re not taking care of ourselves first, we’re not likely to be much good for others. I was glad to be there with my mother (who, in this daughter’s opinion, could stand a little more practice in the way of self care, balance and boundaries…I’m just sayin’…). So, it’s been a heady week full of several themes I’m pretty passionate about: yoga, tea, creative expression and taking good care of oneself. That leads me to encourage you all to take time to find joy in something you’re passionate about, too. I know this much: it’s good for your well being. Hmmm, YUMMY sweater. You look smashing, darling. And very Santa Fe! Such delights being served up on your (Limoges) plate of late. And no one deserves it more. P.S. Many of us ladies-of-a-certain-age are dressing with an eye towards a bit of camouflage in the belly area. Lord knows, I’ve been doing it for years–although not as stylishly as you are! Tears of joy are in my eyes as I read your entry. Your journey continues to remind all of us to enjoy the moment and the small gifts in every day. I’m particularly enjoying the moment of envisioning you at yoga, tea and modeling that great sweater. What an amazing week. Just the start of many more to come. I concur with Kate and Ali. You look radient and are an inspiration. I write this on the morning after my 50th birthday party feeling more inspired than ever to practice self care and boundaries, get more exercise and be present for every moment of life. Enjoy!! Hi Miss Karen, Soooo good to read about your wonderful experiences. You look gorgeous in the sweater. I am especially thrilled about your tea meeting. Every time I have tea I feel such a special feeling inside at the meaning it has brought to my life. It is my ritual, my touch stone, a beautiful experience I give to myself as often as possible. And I owe it to you following your passion and teaching what you know. Glad you got to do the yoga too. I know that means so much to you. I love reading your postings. Keep ’em coming. The sweater is as almost as beautiful as you are!!!! It looks wonderful and ohhh sooo comforable. Sending healing thoughts and some warm FLA sunshine!